To Cite: Motlagh Z, Hidarnia A, Kaveh M H, Kojuri J. 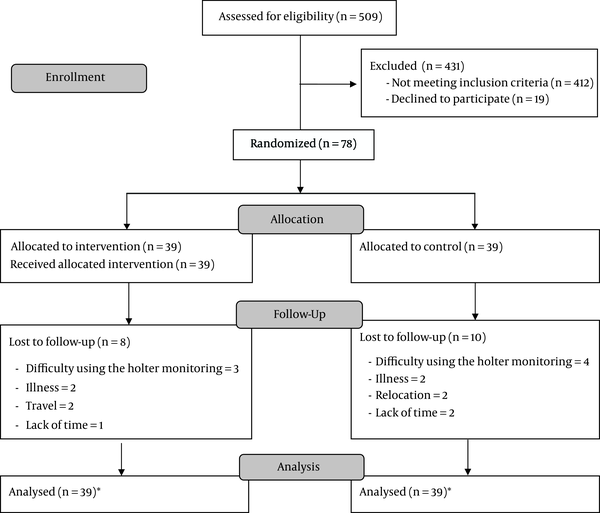 Effect of Theory-Based Training Intervention on Physical Activity and Blood Pressure in Hypertensive Patients: A Randomized Control Trial, Iran Red Crescent Med J. 2017 ; 19(7):e55610. doi: 10.5812/ircmj.55610. Background: Adherence to regular physical activity (PA) remains a challenge for hypertensive (HTN) patients. The present study was aimed at assessing the effectiveness of theory-based training intervention on PA and blood pressure in HTN patients. Methods: The randomized control trial conducted at the healthy heart house in Shiraz, Iran, from January 2015 to January 2016 on 78 HTN patients (39 experimental group (EG) and 39 control group (CG). The exercise program for the EG included 30 minutes of fast walking at 40% to 60% of maximum heart rate reserve 5 days a week for 3 months. The study outcomes included PA stages of change, exercise self-efficacy (ESE), decisional balance, PA and 24-hour ambulatory blood pressure (ABP) and were measured at the onset and at three months post-intervention. Results: Between baseline and three months post-intervention, a greater increase in PA was observed in the EG than in the CG, giving a mean difference of 872.50 metabolic equivalent (MET), p = 0.004. The mean change from baseline to three months post-intervention in 24-hour systolic and diastolic ABP were significant between the EG and CG (mean difference -9.48 mmHg, P = 0.007 and -4.51 mmHg, P = 0.010 respectively). In the EG, 35 subjects (89.7%) and in the CG, 8 subjects (20.5%) entered the stage of action. The mean change from baseline to three month post intervention in ESE and decisional balance was significant between the EG than the CG (mean difference = 20.20, P = 0.001 and 0.50, P = 0.024 respectively). Conclusions: Among HTN patients, a three-month Theory-based training intervention used was effective in increasing PA and reducing 24 hour ABP. Hypertension (HTN) is the third leading cause of death worldwide, causing 7.5 million deaths annually (12.8% of all deaths) (1, 2). The prevalence of HTN globally in 2014 in men aged 18+ years was 24% and in women was 20.5%. For Iranian men, this figure was 24.1% and for Iranian women was 23.3% (3). The seventh report of the joint national committee on prevention, detection, evaluation, and treatment of high blood pressure (JNC7) states that adoption of a healthy lifestyle is an inevitable part of the management of people with HTN and one component of this is regular aerobic physical activity (PA) such as fast walking (at least 30 minutes most days of the week) (4). PA is associated with a lower incidence of HTN in different populations and reduces the blood pressure (BP) of people with HTN and normal BP (5). In several studies conducted on people with HTN, less than 20% of participants had regular PA (6-8). Motivate people to participate in PA is challenging, especially seniors who suffer from HTN (9). One of the principles and preconditions for the effectiveness of health promotion programs is the application of theory which helps to understand and determine the basic elements for behavior changes in the long term (10). Among the theories or models of behavior change, the trans-theoretical model (TTM) is suggested as a theoretical framework to guide interventions that including the constructs of stages of change, processes of change, SE and decisional balance (11). Although the TTM is theoretically sound, few studies have been conducted to examine the effects of TTM-based intervention on PA among HTN patients. In a study, PA intervention based on stages of change on 10 women with HTN, walking increased from pre-to post-intervention (12). Meanwhile, a quasi-experimental study by Chiang et al. based on stages of change, showed that a walking program had no significant effect upon participants’ BP or walking endurance (13). Finally, Lee et al. investigated the effect of walking based on the theory of SE on BP found a decrease in systolic BP and increase in exercise self-efficacy (ESE) scores (14). As regards the inconsistent conclusions and limitations of mentioned studies such as low sample size, quasi-experimental design, recruitment of participants in advanced stages of change and low number of constructs; this study with omit mentioned limitations was aimed at assessing the effectiveness of theory-based training intervention on PA and BP in HTN patients. This was a concurrent parallel randomized controlled trial. Participants individually randomized to one parallel groups. Unit of randomization was patient. We used equal randomization and the study objectives were explained to each participant and informed written consent was obtained. The study was approved by the ethics committee of Tarbiat Modares University. This study is registered retrospectively at www.irct.ir (No. IRCT2016061428463N1). Inclusion criteria were that patients should be diagnosed with primary HTN; have a systolic BP of less than 170 mm hg; be taking at least one anti HTN medication; have completed at least 4th grade education, have no orthopedic limitations to walking; be cleared for moderate-intensity walking by a cardiologist; have a current PA level that is less than the criterion (30 minutes of fast walking five days a week); be in the stage of pre-contemplation, contemplation or preparation; and be ≤ 69 years of age. Exclusion criteria were diagnosis of cardiovascular disease, diabetes or depression; history of heart attack or stroke; and taking drugs for weight loss. The study took place at the Shiraz healthy heart house in Shiraz, Iran, from January 2015 to January 2016. Shiraz healthy heart house is affiliated to the cardiovascular research center of Shiraz University of Medical Sciences and delivered freely services such as screening of cardiovascular diseases and prevention tests. This center is public and not referral. So far 15200 persons were screening in this center. EG. The EG comprised 39 patients, divided into four groups. Participants attended a four-session training program in which meetings were delivered on a weekly basis. The first session provided basic knowledge on the definition, complications and treatment of HTN, the role of PA in decreasing BP, understanding the concept of regular and moderate PA, fast walking and how to take a pulse. In the second session, decisional balance through problem solving (15) was educated. In the third session, patients were taught ESE. Four sources of SE were used in the intervention program: 1) identification of performance achievements; 2) vicarious learning from the experiences of success of others; 3) verbal encouragement and 4) interpretation physiological and emotional responses to walking. Commensurate with the each source of SE used appropriate strategies (15, 16). The forth session first determined the target heart rate of each person during PA using the Karvonen formula (17). Each subject was told their target heart rate and asked to take his/her pulse while walking to attain this value. Exercise program offered to the EG included at least 30 minutes of fast walking at an intensity of 40% to 60% of maximum heart rate reserve at least 5 days a week for three months. Each of sessions lasted 90 minute and delivered using interactive method such as small group technic, group discussion and demonstration by PA expert. PA stages of change: PA stages of change was measured using stages of PA change Questionnaire developed by Marcus et al. (18). Subjects were asked to show which options best described their current level of PA (walking, biking, or playing ball for 30 minutes or more, 5 days a week). regularly active for more than 6 months (maintenance), regularly active for the last 6 months(action),action irregularly active and intention (preparation), sedentary and 6-month intention (contemplation), sedentary, no intention (pre-contemplation) (19). SE: SE was measured using the ESE scale developed by Bandura (20). The scale has 18 items scored from 0 to 100 with higher scores representing greater confidence in ability to exercise (21). Decisional balance: Decisional balance was measured using the decisional balance questionnaire developed by Marcus et al. (18). The questionnaire measures a client’s perceived benefits of (pros: 10 items) and the barriers (cons: 6 items) to PA (18). The validity and reliability of mentioned questionnaires have been confirmed in Iran by Roozbahani et al. (21). PA: PA was measured using international PA questionnaire (IPAQ) short form (22). The validity and reliability of the questionnaire have been confirmed in Iran by Moghadam et al. (23). Intensity of walking: Intensity of walking as level of perceived effort as rated from 6 (light effort) to 20 (fatigue) was measured using Borg scale (24).The validity and reliability of the scale have been confirmed in Iran by Parvari et al. (24). 24 hours ambulatory blood pressure (ABP): It was measured using a Microlife AG9443 (Switzerland). Subjects were asked to standardize potential acute hypotensive effects of exercise not to exercise on measurement days or for 24 hours before measurement (25). All of outcomes were measured before and three months post intervention. Rego et al. (26) determined the response of BP in women with HTN at different times during an exercise program and found an average systolic BP after intervention in the CG of 137.5 ± 20.17 and in the EG of 125.8 ± 16.53. Using these finding, the sample size for the present study was determined to be 39 subjects for each group at a 95% confidence interval and 80% power using the Pocake formula (27). Patients were randomly assigned, following unrestricted randomisation procedures (flipping a coin), to one of two groups, EG and CG, after recording all basic measurements. Randomization concealed in sequentially numbered, opaque, sealed and stapled envelopes. All analyses were conducted on an intention to treat basis. Missing data was dealt with by multiple imputation analysis. Kolmogorov-Smirnov statistical test was used to assess normal distribution of data. The independent t-test was used to compare inter-group differences, paired t-test was deployed to compare intra-group differences and the Mann-Whitney and Wilcoxon tests were engaged for non-parametric data. The Chi-square test was used to compare categorical variables. Results were considered significant at P < 0.05. Table 1 shows the characteristics of the EG and CG. An independent t-test was used to compare the differences between the EG and CG; it showed that there was no significant difference between the EG and CG in the PA stages of change, ESE, decisional balance, 24-hour ABP, PA score, frequency, duration and intensity of walking. Eight participants in the EG and 10 participants in the CG did not complete the three-month post intervention (see Figure 1). There was no significant difference between the people completing the study vs. those not completing the study in age (52 vs. 54), number of anti HTN drugs (1.5 vs. 1.2), 24-hour systolic ABP (137 vs. 139), 24-hour diastolic ABP (81vs.84), frequency of walking (3.8 vs. 3.3). aValues are expressed as means ± SD or No. (%). bIntergroup difference were tested by unpaired 2-tailed tests (age, income, weight, BMI, number and duration of consumption of anti HTN drugs). Fisher exact test (gender) or Pearson χ2 test (job, education). *All analyses conducted on an intention to treat basis with multiple imputation of missing data. The mean changes and SDs of study’s outcomes among EG and CG indicated in Table 2. The mean change from baseline to three month post intervention in PA was significant between the EG and CG (mean difference -872.50, P = 0.004) (Table 2). The mean and SDs of study’s outcomes in EG and CG indicated in table 3. At three months post-intervention, the EG showed a significant increase in PA (P < 0.001), but there was no significant difference in these variable for the CG (P > 0.771) (Table 3). At three months post-intervention, the EG showed improvement in PA stages of change compared to the CG (P < 0.001, Table 4). Abbreviations: DABP, diastolic ambulatory blood pressure; IQR, Interquartile range; MET, metabolic equivalent; SABP, systolic ambulatory blood pressure. aPhysical activity was non normal, median and IQR reported. aPhysical activity, frequency, duration and intensity of walking were non normal, IQR and median reported. cDerived from paired T. test. In this study, it was found that an intervention program based on PA stages of change, ESE and decisional balance could significantly enhance PA and walking in the EG compared to the CG. In a study by Lee, based on the theory of SE and one by Gong, based on deployment of TTM in HTN patients, similar results were reported (9, 14). In the aforementioned study by Fort, consisting of a healthy lifestyle intervention based on stages of change and SE in HTN patients, no significant changes were observed in participation in PA (28). One of the reasons why PA increased in our study, compared with that of Fort, may be that in our study four sources of ESE were used, whereas in that study it was not clear how ESE was applied in education. In addition, in this study the decisional balance was used, which was not the case in Fort’s study. In this study three month fast walking could reduce 24 hour systolic and diastolic ABP among HTN patients. The observed effect of 9.48/4.51 is similar to the magnitude reported in recent systematic reviews examining the effect of aerobic PA on BP in HTN patients (29, 30). In Lee’s study based on the SE theory, led to a significant reduction in the systolic BP and no diastolic BP (14). This is not consistent with the present study, which may be due to a higher intensity of walking in the latter. In the present study, the walking intensity was moderate, whereas in Lee’s study the participants were advised to walk at their usual pace. According to JNC7 reducing systolic BP by 5 mmHg is a clinically significant result (13). This decrease is also important because the decrease was assessed in ABP and not in office BP and the risk of HTN cardiovascular complications are more closely associated with ABP than office BP (31). In our study, at three months post-intervention, the EG group showed improvement in PA stages of change, compared to the CG participants. Similarly, Gong et al. (9) and Fort et al. (28) studies on HTN patients, indicated that EG relative to the CG were in higher stages of change at three, six and eight months post-intervention. At three months post-intervention, significant improvement was observed in the ESE and decisional balance scores in the EG compared with the CG. Lee’s study showed a significant improvement in ESE in the EG compared to the CG (14). Another study by Moeini et al. 8 weeks of PA intervention based on the TTM, showed a significant improvement in SE and decisional balance in the EG compared to the CG (32). According of findings of Bandura, SE is the strongest construct in predicting behavior change. He stated that, because one of the most powerful tools to increase ESE is dominance on performance of behavior, it is possible that changes in SE occur following successful and active partnership of individuals in exercise (33). In the present study, it was also concluded that an increase in ESE was associated with increased PA.
From strengths of this study can appointed to: 1. using from more constructs compared with previous studies (stages of change, SE and decisional balance); 2. using four sources of SE; 3.using of 24 hour ABP for evaluating effectiveness of theory based training intervention. ABP monitoring is more physiologically accurate and more reliable than office or clinical BP measurement (34). From weeks of this study can appointed to: 1.relatively short follow up period of three month. It would be needed to evaluate the effects over a longer follow up period; 2. numbers of excluded patients from study. Of course fortunately statistical analysis not showed difference between those who stayed in the study and those who dropped out in terms of demographic and clinical variables. The present study showed that theory-based intervention effectively increased the PA stages of change, decisional balance, ESE, and PA and decreased 24-hour systolic and diastolic ABP. It is suggested that future studies test the effect of this type of activity on other factors of cardiovascular risk. We would like to thank Tarbiat Modares University, Shiraz University of Medical Sciences, Healthy Heart House, Dr Hamid Tavakoli Ghouchani (assistant professor of North Khorasan University of Medical Sciences), Ali Asghar Haeri Mehrizi (research instructor of health metric research center ,Iranian Institute for Health Science Research and all HTN patients who participated in the study. Authors’ Contribution: Zahra Motlagh contributed towards the design, data collection, analysis of the data and write up of the paper. Alireza Hidarnia, Mohamad Hosain Kaveh, Javad Kojuri contributed towards the design and write up of the paper. All authors read and approved the final manuscript. Funding/Support: This work was conducted as part of a PhD Thesis undertaken by Zahra Motlagh and funded by Tarbiat Modares University, Tehran, Iran.